Thomas Silverstein entered the federal prison system in 1975 after he was convicted of three bank robberies that he pulled with his father and his uncle. He was 19 years old. Three years later, he was convicted of murdering an inmate who had run afoul of the Aryan Brotherhood, the most feared white gang in prison. Silverstein was identified as a member of the AB, convicted, and sent to the federal prison in Marion, Illinois, the harshest in the country at the time. A judge later overturned this conviction after ruling that the witnesses against Silverstein, which included a prison guard, were not believable. His ruling came too late, however. By then, Silverstein had been convicted of a second prison murder — this time the strangulation of a black prison gang member. Another murder soon followed. It involved Raymond “Cadillac” Smith, the national leader of a black prison gang who had sworn to avenge his fellow gang member’s death. Prison records show that Smith made several attempts to murder Silverstein, yet prison officials kept the two men in cells close to each other. Silverstein and another inmate, Clay Fountain, broke out of an exercise area and caught Smith as he was leaving a shower area. They stabbed him 67 times and then dragged his body up-and-down the prison tier so that other prisoners, still locked in their cells, could see the bloody corpse. Officer Merle Eugene Clutts was assigned to help bring order to the cellblock where Silverstein and Fountain were housed. Silverstein claims Clutts immediately began harassing him, but an investigation by the federal Bureau of Prisons and FBI would later clear Clutts of any wrongdoing. Silverstein would claim those two probes were whitewashes. Regardless, Silverstein became obsessed with Clutts and spent months plotting his murder. 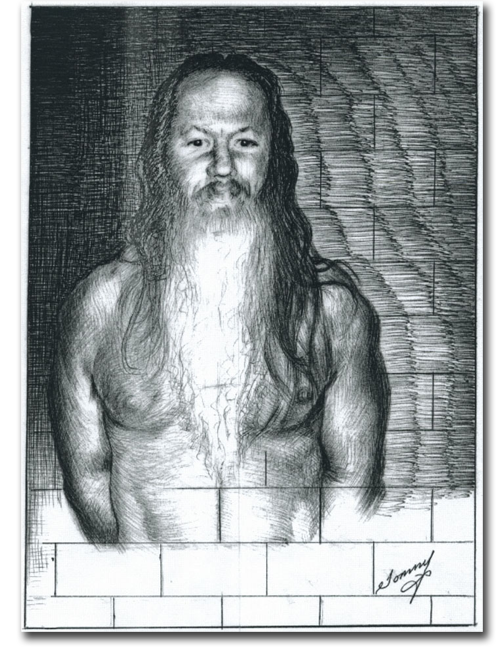 On October 22, 1983, with the help of other inmates, Silverstein slipped off his handcuffs while he was being led to a shower. Brandishing a home make “shank” — knife — Silverstein broke free from the two guards escorting him and attacked Clutts, who was not carrying any weapons. An autopsy later showed Clutts had been stabbed forty times. Thomas Silverstein has been locked under the tightest conditions in the federal Bureau of Prisons (BOP) in total isolation since he murdered a correctional officer in 1983. The lights are kept on 24 hours a day in his cell. At first, the BOP stripped him to his boxer shorts and did not let him have anything in his cell. While security cameras were being installed, two guards sat outside his cell and watched him round the clock. He was kept under these conditions for six months. The BOP then began giving Silverstein additional privileges, such as a television set and drawing materials. Part of the reason was because the BOP realized that it is nearly impossible to control an inmate unless you have something to take away from him as punishment. Silverstein spends much of his day drawing. He is entirely self-taught. The BOP has refused to allow him to enter his work in prison sponsored art shows at Leavenworth where convicts can sell their work to the public. It does not want Silverstein to profit from his notoriety. After I included one of his drawings in The Hot House, I began receiving requests from readers to see more of his work. I am posting several of his drawings here. They are not for sale. You also should be aware that his views are exactly that — his views. Silverstein told me that if I ever wished to understand him, I needed to understand his art because that is how he spoke from his heart. The “Silverstein Suite” — built just for him — is located at the end of the Special Housing Unit (SHU), a building isolated from the main prison. Silverstein was moved here in 1989 from his basement dungeon, that is described in The Hot House. The SHU is a “prison inside a prison” and is commonly call “the hole.” It’s where convicts are sent for punishment. 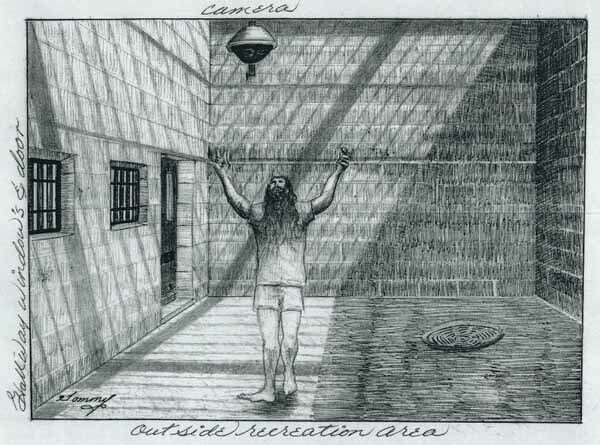 Silverstein is kept in his cell twenty-three hours per day. At certain times, an electronic door is opened for one hour, so he can step into the outside recreation area or into an indoor recreation cage. He is not allowed into the hallway in this drawing. That is used by officers when they need to microwave his meals or check on him face-to-face. There is a visiting room attached to the indoor recreation cage, but since the Bureau of Prisons doesn’t allow him visitors, it has not been used. These three rooms — his cell and the two recreation cages — are his entire world. Because he is under constant surveillance, the only time that he sees other humans is when food is brought to his cell. He has been kept under “no human contact” conditions since 1983. This is the view that Silverstein sees when he sits at the back of his cell. This is the view from the front of the cell, looking back. This is the view from the exercise bike in the indoor recreation room. At one point, Silverstein did two thousands sit-ups and one thousand push ups per day to stay fit. He did them in groups of one hundred. Silverstein standing in his outside recreation cage. The ceiling is open to the sky but is covered by steel bars. Because of his reputation, Silverstein is surrounded by a minimum of eight officers whenever he is removed from his cell. Another officer video tapes the move in case there is a scuffle. The video tape is taken to prove that Silverstein’s civil rights were not violated. The government reviews Silverstein’s isolated status every six months. So far, it has seen no reason to move him into a more normal environment where he could interact with other inmates. He is considered in sound mental condition despite his long term segregation and lack of visitors. Once a month, a prison psychologist visits Silverstein to ask how he is doing. 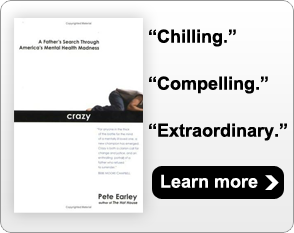 If he shows anger or complains about his conditions, then the psychologist knows that he is “mentally stable” since that reaction is considered a normal one. A self-portrait of Silverstein drawn to a higher level of realism. 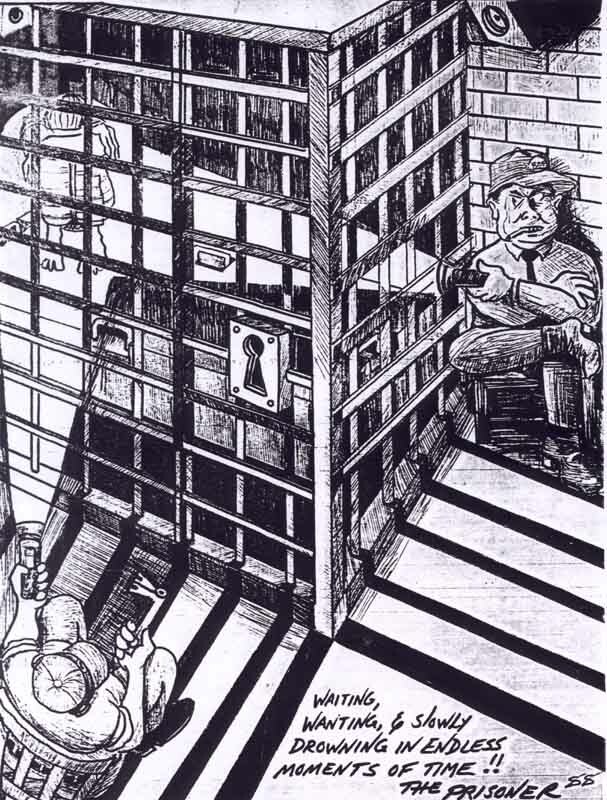 One of the subjects Silverstein continuously drew were the prison guards who watched over him. As you would expect, his drawings are less than favorable of the guards.